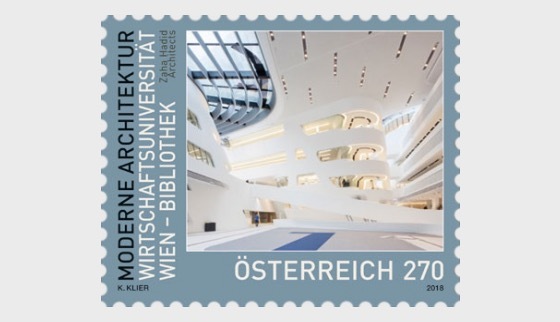 As part of the “Modern architecture in Austria” series, Austrian Post is presenting the library ofVienna University of Economics and Business (WU), which impresses with its unusual design. Vienna University of Economics and Business moved to the WU campus in 2013. The new site between the Messe Wien, the Prater and the Krieau racetrack is a new university campus with disabled access, comprising six building complexes designed by top international architects. Another departmental building was opened in the immediate vicinity in 2015. The heart of the WU campus is the Library & Learning Center, known as the LC for short. It was designed by Zaha Hadid Architects, Hamburg, and is characterised by a light and a dark structure, separated from one another by a glass section. The significantly protruding roof reminds one of a monitor. The large glass surface of the “monitor” looks out towards the Prater. From the publicentrance area, numerous stairways and ramps take you on a spiral route to the upper levels. Here the extensive library centre spans over six floors, also offering a spectacular view over the campus and the Prater. In addition to the library, the LC also houses other student services. The remaining university building complexes are grouped around the LC, the whole occupying a total area of around 35,000 square metres. The campus also includes facilities open to the public, such as restaurants, a sports centre and a nursery. Around 23,000 students from Austria and abroad take advantage of the comprehensive rangeoffered by WU Vienna, which includes bachelor's, master’s, doctoral and PhD courses in both English and German. The WU was founded in 1898 as the “k.k. Exportakademie”, which providedcomprehensive training for the export trade. In 1919 it was converted into a state university for world trade and it has been called the Vienna University of Economics and Business since 1975. The top-class international accreditation attests to the high quality standards at the WU, which is part of a network of more than 200 international partner universities.